Blood pressure is the pressure on your artery walls as blood passes through them. Blood pulses through your vessels as waves; the higher figure is the pressure as the wave peaks (when your heart beats) and the lower figure is the pressure once the wave has passed and your heart rests e.g. 120/80 (see image). Blood pressure is usually around 120/80. High blood pressure (hypertension) is when your blood pressure is 140/90 or more (either figure raised) and remains continuously at this level. Blood pressure is not fixed. In a healthy person it rises and lowers to meet the demands of activity, i.e. it will rise when exercising, walking up stairs etc. and returns to normal once the activity has ceased. 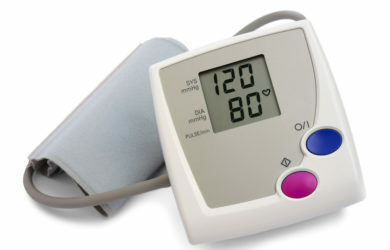 For people with high blood pressure the level rises with activity, but at rest the level is more than 140/90. Your blood pressure tends to rise very slowly over time and therefore you don’t tend to notice any signs or symptoms that you have developed high blood pressure. For this reason it is called ‘the silent killer’. High blood pressure is strongly associated with heart attack, stroke, diabetes and kidney disease. Really, the only way to know if you have high blood pressure is to have your blood pressure measured regularly. High blood pressure is the first indication that there has been a change in the body that could lead to heart disease, stroke, kidney disease and diabetes. If any of these conditions run in the family it is a good idea to have your blood pressure checked to reduce the risk of developing them. Where can I have my blood pressure measured? If you are over 40 you will be offered an NHS Health check by your GP practice or you can check if you are eligible for one at any of the pharmacies or optical practices above. Your blood pressure will be measured as part of the check. Reducing alcohol – One drink will raise your blood pressure. It will rise further and further with each drink. Cutting down to the recommended levels if you drink too much is the most effective way to reduce your blood pressure. Cutting down on salt – Too much salt makes your body retain water and the water adds to the volume of blood inside your blood vessels, making your heart work harder and your blood pressure rise. Reducing salt to no more than 6g a day will reduce water retention. But, do not replace salt with salt substitutes and remember that medicines can contain high levels of salt, e.g. antacid remedies, some painkillers. Ask your pharmacist for advice. Stopping smoking – Smoking provides the perfect environment for cholesterol to build up in your blood vessels and make them narrow or even blocked. A narrowed blood vessel will make your heart work harder to pump blood through it and the blood pressure in your blood vessels will rise. Cutting down on caffeine and energy drinks – Stimulants such as caffeine will increase your blood pressure. Limit coffee to no more than 4 cups (approx. 2 mugs) a day. Also, limit drinks containing caffeine, such as cola and energy drinks. Try caffeine free versions. For best health results, adopt a healthy lifestyle as well as taking your medication. A healthy lifestyle may well mean that your blood pressure returns to normal and if you are already taking medication, it may mean it can be stopped. Speak to your GP for advice. If your doctor has prescribed medication, remember to ask questions to make sure you understand what it does and what to expect as well as how often you need to be seen for check ups etc. You can get this information from your GP, practice nurse or your local pharmacist.